This spring saw the arrival of a fresh and lovely new restaurant at Vancouver’s Fairmont Pacific Rim Hotel. 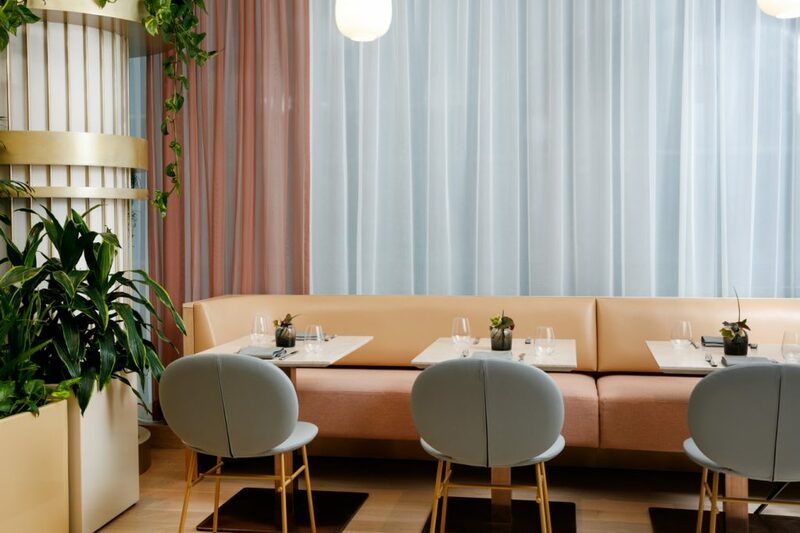 Located upstairs, past the lively, music-filled ground floor Rawbar and lounge, Botanist, helmed by executive chef Hector Laguna (formerly of Hawksworth), presents seasonal Pacific Northwestern ingredients with respect and sophistication. Designed by local firm Ste. Marie (also responsible for atmospheric Vancouver favourites including Osteria Savio Volpe, Kissa Tanto, and Mosquito) the 5,000-square-foot space is softly pretty. The dining room beckons with dove grey tabletops, rose gold accents, and butterscotch leather banquettes, while a riot of dangling greenery rims the ceiling for an effect that recalls whispers of another Ste. Marie project—2014’s short-lived, similarly verdant Gastown restaurant Blacktail Florist. Each meal begins with particularly tasty fresh-baked bread—brioche or fougasse—by pastry chef Jeffery Kahle. It sets the tone well for chef Laguna’s dishes, in which ingredients are treated simply and shine for it. A starter of hand-cut tagliatelle comes studded generously with morel mushrooms and topped with Piave crisps, and a fat tendril of charred octopus arrives covered in shaved snowflakes of cauliflower and surrounded by spicy chorizo—both are simple, very good, and perfectly reflective of local bounty. A main of roasted Wagyu zabuton steak is served with layered celeriac, nettles, and more morels while the sablefish’s crisped exterior pairs nicely with airy crackers of puffed tapioca floating atop a light, creamy (but cream-free) onion nage, all dappled with edible flower petals. Such details feel a little ethereal and fairy-ish, but this is Lotusland after all, and Laguna speaks the language fluently—anyone seeking a quick immersion in local luxury couldn’t ask for a better interpreter. Botanist’s cocktails are wild. Head bartender David Wolowidnyk and creative beverage director Grant Sceney have created “Vancouver’s first and only cocktail lab” and enthusiastically mix potions like the Deep Cove (tinted vivid turquoise with blue algae) and the Pretty Bird (served in a glass bird). These are novel and fun—enough so to tempt one upstairs to discover a whole garden of earthly delights.